Testagenix 180 is an “advanced testosterone booster” that claims to “help enhance performance”. The question you need to ask is whether this product is as effective as it is claimed to be? We have reviewed countless products that fail to live up to their own hype. One major issue with trial offers like this is that they are often a lot more expensive than you may think. Many lead onto auto-ship programs, which subsequently lead to customer complaints. Is this the case with Testagenix 180? Please continue reading to discover the truth behind the claims. 4 Is the Testagenix 180 trial a scam? Of course these claims sound impressive, remember these claims are designed to entice you into signing up for the offer as quickly as possible. This does not necessarily mean that the claims are accurate. To check the accuracy of the claims I would recommend looking more closely at the ingredients used, this is the best way to check the effectiveness and is also essential to ensure the product is safe to use too. You most certainly don’t want to be using a supplement that could potentially cause side effects do you? Does Testagenix 180 contain any testosterone boosting ingredients? From looking at its label I can say that it does. Among the ingredients listed are proven testosterone boosters such as Horny Goat Weed, Tongkat Ali, Saw Palmetto, Orchic, Wild Yam Root and Sarsaparilla Root. There is nothing new or exciting about these ingredients, but that is not a bad thing. Many of these ingredients have been used in other leading testosterone boosters, and that is because they work. I certainly would expect some benefit to be experienced through the use of this supplement. Of course for best results you should continue eating a healthy protein rich diet and also continue training hard. As Testagenix 180 is available you may expect it to be free, but this is not the case. In fact you may be shocked to learn that most trial offers are not free. When looking at trial offers like this it is important to read any terms and conditions available. This is where the true cost of the supplement is usually revealed. These T&Cs state that there is a $4.95 shipping charge to pay when you first sign up to the offer. Once paid you will be allowed 18 days to trial the product, after this period has ended you will be charged again, this time $87.63. As Testagenix 180 operates an auto-ship program, failure to cancel the trial will mean that further monthly deliveries and charges will be sent to you. The only way to cancel these is by contacting them to cancel your subscription (details below). Is the Testagenix 180 trial a scam? Looking at the ingredients found in this supplement has revealed that at least some benefit will be gained from its use. Unfortunately there is a major issue that stops me from recommending this offer. Testagenix 180 is too expensive when compared to similar offers, and as mentioned before the auto-shipping is likely to lead to complaints if our previous reviews are anything to go by. It is important that when looking at offers like this that you know exactly what you are signing up for. Do your research beforehand to ensure you do not make an expensive mistake. If you have signed up to this offer and would like to leave your own review then you can do so by completing the comment form found below. We would love to hear about your experiences. 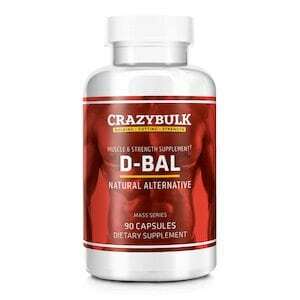 Our recommended alternative is a product called D-Bal, which is available to buy online via the Crazy Bulk website. This testosterone booster is made using proven ingredients that has been shown to mimic the effects of the banned anabolic steroid Dianabol, but without the side effects. D-Bal is completely legal to both buy and use, and as it is not available for trial there is no chance that you will encounter any hidden charges or auto-shipments.